It may be the last thing on your mind before going on vacation but making sure the house is clean and tidy before you leave will make your return much more welcoming. Do the dishes; wipe out the fridge and throw away food that will expire while you're gone. Dust, vacuum, and wipe down kitchen surfaces to avoid coming home to dust balls and bugs. Don’t forget to wash and put away laundry too. Give the pet sitter or boarding facility detailed care instructions and a generous supply of your pet’s food, toys and medicines. Ask a friend or neighbor to water your plants or invest in self-watering plant stakes. Request a hold on your mail and newspapers so they won't pile up in front of your house while you're gone. During a short trip, leave a few lamps on throughout the house to make it look occupied. For a longer vacation, invest in inexpensive automatic timers that can turn our lights on and off at staggered intervals, making your house look occupied. Alert your home-security service or a trusted neighbor so one or the other can keep an eye out as well. 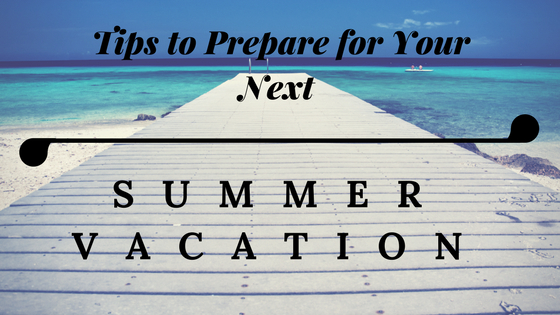 Resist the urge to share vacation news on social media in advance of or during your trip. Burglars’ surf social media for their next “hit” and vacationers posting their plans make for perfect targets. Save your vacation news and pictures for AFTER your return. Temporarily adjust the thermostat to 78 degrees to conserve energy while no one’s home. Unplug unnecessary appliances and turn off gas burners. Whether you’re driving to the airport or hundreds of miles to your destination, making sure your vehicle is in safe operating condition is paramount. If you’re due or overdue for an oil change, and/or tune-up, now’s the time to get your car ready for your summer vacation. Replace old worn out tires or check tire pressure on newer ones. Before you hit the open road, give your vehicle a thorough cleaning inside and out--you and your family will enjoy the drive and each other much more in a clean car rather than in cluttered mess. Before you leave for your next summer vacation, a review of your current home and auto insurance coverage with an independent insurance agent can give you peace-of-mind that you’re covered adequately at home and on the road.